So what exactly would one pair with chickpea gnocchi? Like I said, I have no recollection of what one particular chef in Oregon was doing with them. I think the word “curry” landed on the tip of my tongue before I even finished reading the description of that dish. The important bit is that I knew my chickpea gnocchi dish was going to take on some serious Indian overtones. Talk about gnocchi fusion! I bet many of you think of gnocchi as a potato-based pasta dough pinched off into little pillowy dumplings. And course, you’d be correct. This is what I thought, and my initial plan was to substitute pureed chickpeas for the potatoes. I even found a recipe online, from a highly reputable and popular chef, so I figured this would be a surefire success on the first try. No such luck. My dough wouldn’t stick at all, and after tediously rolling each gnocchi individually, my efforts were defeated as the gnocchi fell apart in the boiling water and later clumped together in a pile of mush when I tried to saute them with their accompanying vegetables and sauce. 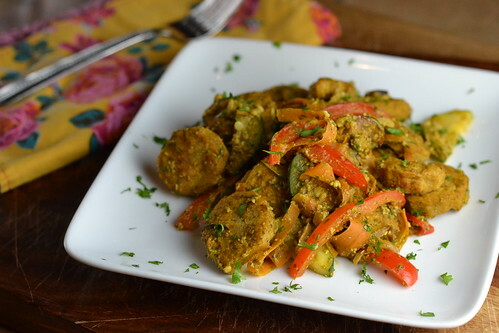 The good news, however, is that the combination of curried chickpea gnocchi mush with zucchini, carrots, red peppers, and a zesty cilantro-cashew pesto was so good that I was determined to work it out into something I was confident enough to share with you. And I did, the very next week. It turns out that not every Italian family makes gnocchi that same way we Americans mostly think of it. For some, gnocchi is made from cornmeal, cooked up polenta-style and allowed to set before being sliced or cut into small shapes and fried up with various toppings. 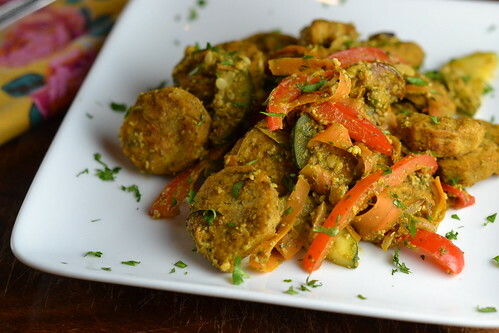 I created my Indian-inspired version by following a similar method with chickpea flour and spices, and baking the gnocchi as a healthier alternative to frying. The result? These deliciously spiced gnocchi held their shape much better, and tasted wonderful when tossed with summery vegetables and my fresh, lower-fat pesto. Spray a 9×13″ rimmed baking sheet with nonstick cooking spray. Combine all of the gnocchi ingredients in a blender and process until smooth. Pour into a medium saucepan and heat over medium-high heat, whisking to keep it smooth. When the mixture begins to bubble and thicken, cook for 5-10 more minutes, stirring often with a wooden spoon. Once the mixture becomes very thick (hint: if you scrape the bottom of the pan, the mixture should hold its shape so that you can see the bottom of the pan for a few seconds) pour it into the prepared pan and smooth the top. Allow to cool for about 10 minutes, then cover and refrigerate for at least two hours or overnight. Preheat oven to 450ºF. Use a small round cookie cutter to cut the polenta, or slice into small squares. Transfer to a baking sheet lined with parchment paper. Bake for 20 minute, turning halfway through, until golden and slightly crisp. Meanwhile, heat the coconut oil over medium heat in a large nonstick skillet. Add the vegetables, and saute for about 10 minutes, stirring occasionally, until softened and lightly caramelized. Combine all of the pesto ingredients in a blender and process until smooth. Pour the pesto into the pan with the vegetables. Add the toasted gnocchi and toss to coat and heat through. Serve immediately. Hmmm a new use for chickpea flour! I'm going to have to try these. I definitely agree that is a first. What great inspiration. I'm loving all your uses for chickpea flour these days. Like Ranjani I have a bunch as well that I don't get to very often. Perhaps some gnocchi are in order? Maybe not a restaurant, but I've definitely heard of a dish and had that "OMG must make immediately" moment. 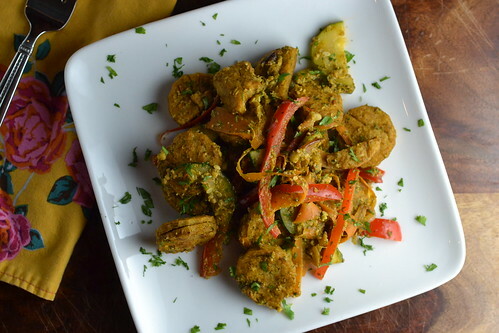 Yes – the uses for chickpea flour continue. I am really intrigued by this recipe and would love to try to make "traditional" gnocchi with it – did you attempt this? You mean potato gnocchi, using chickpea flour instead of regular flour, right? I did not try that, but I could see it working. My first attempt for the chickpea gnocchi involved pureed chickpeas with some tofu and other stuff, and that's what did NOT work so well. If you try it, I bet the combination of sweet potatoes + chickpea flour would be extra delicious! Given my INTENSE addiction to curry and chickpeas and all things vegetable…I think it's safe to say that I'll be making this ASAP. Even though my last gnocchi experience did leave me traumatized (took me six hours to make them)…but I think it's time I get back on the horse, right? OMG, that gnocchi is genius Cara!! I've never had success making my own gnocchi. But- I did buy whole wheat gnocchi at trader joes! I wonder if I can adapt this so it has the same flavors but without making my own. always creative cara! Love the idea of chickpea gnocchi, Cara. Healthy as all get out and it looks delicious. I love the cilantro pesto! I just have a question for you…how do you come up with such creative ideas? I can honestly say this would have never occurred to me. BUT I think it is such a brilliant recipe!! Brilliant. Baked chickpea gnocchi. Looks incredibly flavourful! Mmm, what unique gnocchi! I need to get some chickpea flour! I just found your site and I’m having a ball going through your recipes! When the dough is cool enough to handle, dollop it along one edge of a piece of parchment paper or plastic wrap, then roll it up as tight as you want until it squeezes down to your desired diameter. Chill until firm. Cut. Then bake pieces as recipe states. This way you could avoid having to cut them with a round cutter and wondering what to do with the scraps, or cutting them into squares, triangles or diamonds when you really want circles. A variety of shapes would be kind of fun though. I recently saw a “polenta pizza bite” recipe – (pretty self-explanatory). This dough should work well for that too. Just make the roll of dough into a much thicker diameter like the ready-made polenta rolls you can buy. When cold, I’d slice it fairly thin, not much more than 1/4″ or so to avoid interior gummy-ness, then pre-bake (or dry-fry) them, in order to give them a toasty crust, then put the pizza ingredients on top and broil.